Who: I am Brianna Penrod and I am a nanny while I am waiting to start nursing school. I am wearing Molly, an active and beautiful 4 month old baby girl. Where: This photo was taken after we got back from Wegman’s and we were in the kitchen. 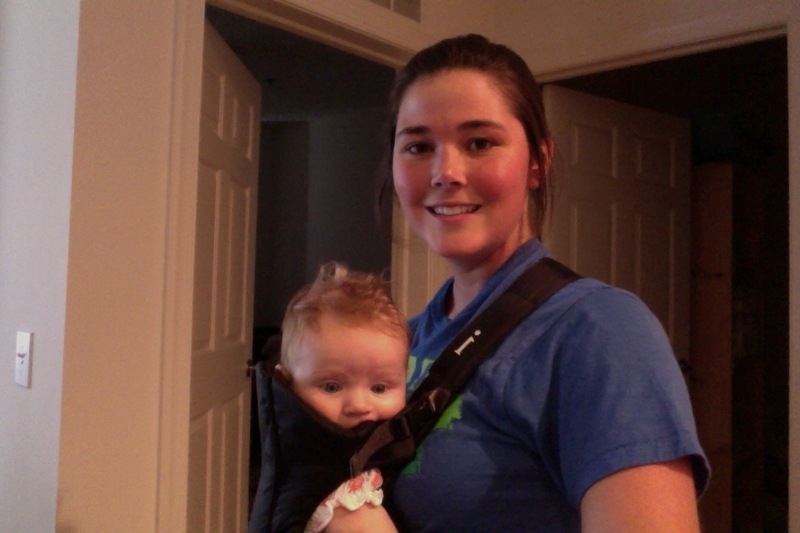 What: I was wearing the Infantino carrier while I was walking to the grocery store to get lunch. Carrying Molly was a lot easier than pushing her in the stroller. I had full use of my hands and she was happier to be close to me. I also noticed that people at the grocery store were more helpful when I was wearing Molly, as opposed to pushing her in the stroller. Overall, I prefer wearing Molly and enjoy the experience. Why: I was wearing Molly because it was convenient and because she is happier! I also like being close to her while also being hands free.